Panera Bread doesn't want guns in its restaurants. The sandwich-and-soup chain out of St. Louis, said it doesn't want armed customers in its more than 1,800 stores in an effort to increase the comfort of its unarmed patrons, joining a growing list of other companies who have issued similar directives. The news is another victory for gun safety group Moms Demand Action in its campaign to get guns out of America's restaurants and retailers. "We ask that guns not be brought into this environment unless carried by an authorized law enforcement officer," the company said in a statement. "Panera (PNRA) respects the rights of gun owners, but asks our customers to help preserve the environment we are working to create for our guests and associates." The company first announced the decision during a CNBC interview with Panera CEO Ron Shaich. He said during the interview that the company would not post anti-gun signs in its stores or require employees to confront gun owners. Shannon Watts, the founder of Moms Demand Action, said Panera approached the group three months ago in an effort to move quickly on the issue. "In this case we saw a company come to us proactively," she said. "We're seeing that happening more and more." She did not say which other companies had approached the organization. 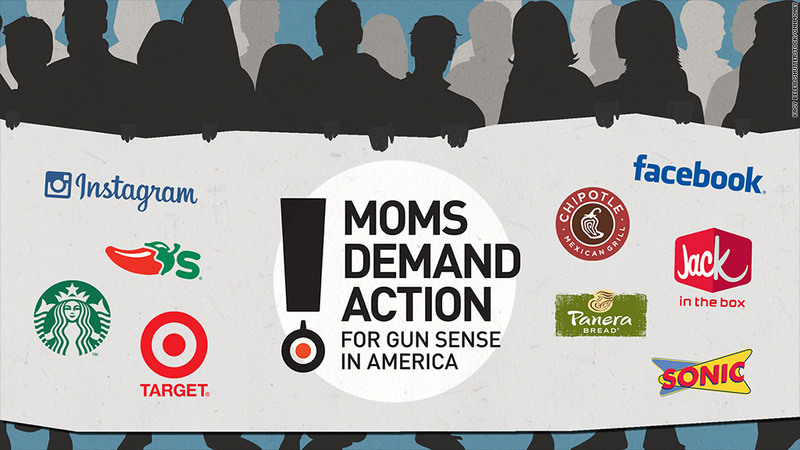 Moms Demand Action, which got its start in 2012 following the Sandy Hook Elementary School shooting, has been actively targeting other companies, including Target (TGT), Chipotle (CMG) and others, to take public stands against carrying guns in their stores. Both companies issued similar requests to Panera's earlier this year. The group announced last month a campaign for grocery chain Kroger (KR) to follow suit. 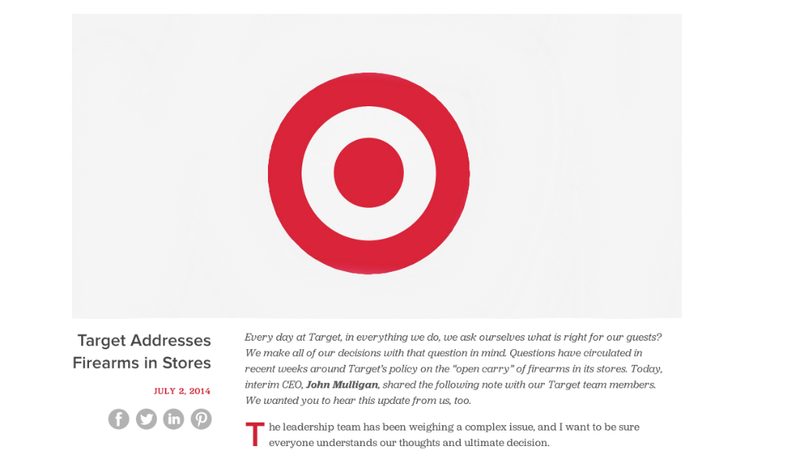 -- An earlier version of this story included a graphic that erroneously implied Staples is one of the companies that stands with Moms Demand Action.